SEOUL, July 26 (Yonhap) — The wife of North Korean leader Kim Jong-un visited South Korea in 2005 as part of a cheering squad for an athletic event, a South Korean lawmaker said Thursday, citing information provided by the South’s spy agency. 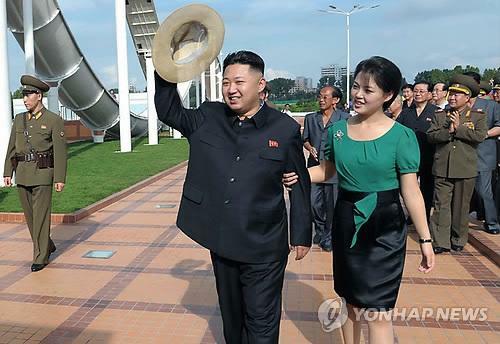 The revelation came one day after North Korean media identified the woman recently pictured flanking Kim as his wife, Ri Sol-ju. South Korea’s National Intelligence Service (NIS) confirmed local media reports claiming Ri had visited the South Korean city of Incheon in 2005, Rep. Jung Chung-rai of the main opposition Democratic United Party told reporters after a parliamentary interpellation session attended by Won Sei-hoon, the director of the NIS. Her visit was during an Asian athletics competition held in Incheon in September of that year, he said. It is rare for South and North Koreans to visit each other’s countries, as they must receive special permission from their respective governments. The two Koreas remain in a technical state of war following the 1950-53 Korean War, which ended in an armistice, not a peace treaty. NIS officials told lawmakers they believe Ri was born in 1989 and married the North Korean leader in 2009, according to Jung. The leader, whose age has been disputed due to the secretive nature of the reclusive regime, was confirmed to have been born in January 1984, the NIS officials said in the closed-door session. The spy agency interpreted the North’s disclosure of the first lady as an attempt to give Kim a “stable image,” according to Jung. News reports have often cited sources familiar with the communist regime as saying Kim lacks the support of his people due to his young age and lack of experience. The young leader inherited the military-backed regime following the death of his father and longtime leader Kim Jong-il last December. NIS officials also confirmed reports that Ri is a singer for the North’s Unhasu Orchestra, according to Jung. Details of her background have yet to emerge, but she is believed to have been born into an ordinary family and studied vocal music in China, he said. Meanwhile, Rep. Yoon Sang-hyun of the ruling Saenuri Party quoted NIS officials as saying North Korea’s former military chief Ri Yong-ho was dismissed earlier this month because of his “uncooperative attitude” toward Kim’s drive to tighten his grip on the military. North Korea announced Ri’s dismissal last week in a surprise move that fueled speculation about a possible power struggle in Pyongyang. Asked to explain the “uncooperative attitude,” Yoon said it was related to a generation shift within the 1.2-million-strong armed forces as Kim Jong-un moves to transfer control of the economy from the military to the government. The lawmaker also quoted NIS officials as saying Ri appeared to have been “purged,” based on a July 21 re-run on North Korean state television of a visit to an orchard by Kim Jong-il and Kim Jong-un last year. Scenes of Ri, who accompanied the Kims on the trip, were deleted from the clip, he said. On Kim Jong-un’s aunt Kim Kyong-hui and her husband Jang Song-thaek, both powerful figures in the communist regime, NIS officials said they appear to be strengthening their roles as the young leader’s guardians by respectively providing mental support and policy advice. It is also the spy agency’s assessment that the North’s three-generation hereditary power succession has been completed with Kim’s promotions to the top levels of the country’s ruling Workers’ Party, government and military. Following Ri’s dismissal, the North announced its leader had been given the title of marshal, the highest functioning military rank. The NIS noted it took three years for former leader Kim Jong-il to complete his inheritance of power from his own father, the North’s founding leader Kim Il-sung. 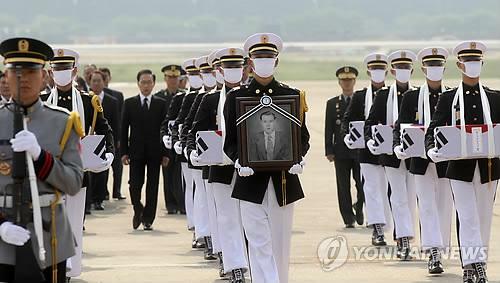 SEOUL, May 25 (Yonhap) — The remains of South Korean soldiers killed in North Korea during the Korean War returned home on Friday via the U.S., marking the first such repatriation of South Korean war dead since the 1953 armistice. Twelve sets of remains, two of which have been positively identified, were among 226 sets recovered in the northern part of North Korea by a U.S. excavation team between 2000 and 2004, before Washington halted the joint recovery mission with Pyongyang due to concerns over the safety and security of its workers. After conducting DNA tests, the U.S. Joint POW/MIA Accounting Command (JPAC) in Hawaii confirmed last August that some of the remains were those of Asian soldiers. Since then, Seoul and Washington have conducted joint analyses to identify the remains and 12 sets were confirmed to be from South Korean soldiers, officials at Seoul’s defense ministry said.